Turquoise beads ring by Kenneth Jay Lane. 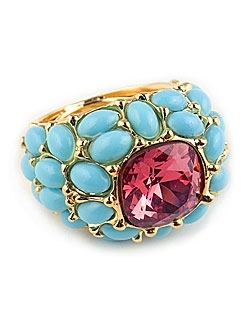 This striking designer ring features a 15mm rose swarovski crystal in the center surrounded by turquoise beads. Rings comes in one size with adjustable springs to customize size. A stunning ring for the woman that loves to make a statement, easy to wear all day! Also makes a wonderful gift!